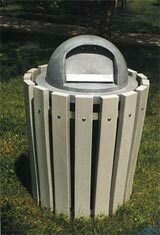 This heavyweight open top waste container can withstand hard use and is perfect for recreation areas, businesses, and public use. Made with 100% recycled plastic. The molding never requires painting and is virtually maintenance-free. Plastic liner and dome top lid are sold separately.